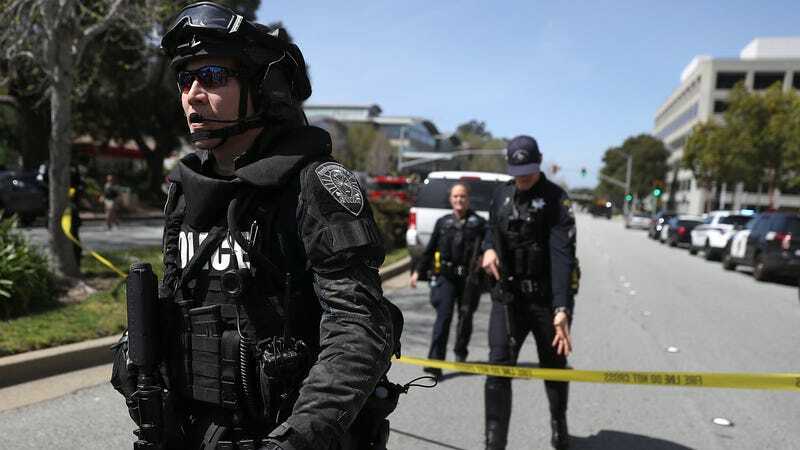 Police respond to a shooting at YouTube’s campus in San Bruno, California on April 3rd. Authorities have identified the suspect in the mass shooting at YouTube’s headquarters, which ended in four injuries and the death of the shooter, as YouTuber Nasim Aghdam, who made videos about topics ranging from animal rights and veganism to bodybuilding. Police have not named any motive in the attack, but Aghdam has now been widely reported to have been very, very angry about the same issue as a lot of YouTubers: content moderation, and specifically a wave of demonetization incidents that have killed ad revenue for many of the site’s small creators. Initially, this news resulted in random bad faith internet weirdos celebrating Aghdam as some kind of martyr. What’s troubling is that the shooting is now being framed by many media outlets as part of the greater backlash by small creators against YouTube, as though the attack provides a meaningful takeaway about the site’s relationship with its community. Over the past day, a slew of pieces have offered this angle. A New York Times story proclaimed “YouTube Attacker’s Complaints Echoed Fight Over Ad Dollars,” saying that the shooting appeared to have been motivated by a trend in which YouTube “clamped down and pulled ads from thousands of controversial videos.” The paper added “anger around demonetization has been growing for more than a year,” bizarrely looping in discontent around consequences for YouTubers who made offensive videos like popular vlogger PewDiePie. The Verge suggested the shooting made “hard community management questions even harder.” The San Francisco Chronicle said the attack “highlighted” the conflict between YouTube and its creators, listing pretty much every grievance by users about the site’s role as gatekeeper. But—as all of these outlets acknowledged in requisite throwaway lines—none of these other angry YouTubers have armed themselves and shot up the company’s campuses. Aghdam was also a vegan, of Middle Eastern heritage, and a bodybuilder. That information may tell us something worth knowing about the shooter, yet—unlike something actually informative like a tie to a radical ideology—it tells us nothing about vegans, Middle Easterners, or bodybuilders in general. Framing the relationship between YouTube and its community as of primary importance in this incident carries two nasty insinuations. One is that the shooting was somehow a consequence of YouTube’s corporate practices, which requires a logic-defying willingness to condense six degrees of separation into one. The second is that Aghdam is on some level, even a tiny one, representative of YouTubers mad about those consequences. This is absurdly unfair to both parties. While the connection between creator backlash and the shooting is easy to make, a far more important one exists between this attack and other incidents in which someone has used a gun to inflict their unhappiness on large groups of strangers. Ultimately, these pieces illustrate how the debate over the United States’ gun problem has become so intractable that observers now regularly look for whatever else could be to blame instead of the guns. If you want a takeaway here, how about this: Widespread access to firearms across the country makes it simple for anyone with a grudge to solve it by going and trying to murder the people they’re angry at. Those victims could be elected officials, they could be school students, they could be patrons at a gay nightclub, they could be attending church or a concert on the Las Vegas strip. They could be sitting in an office at YouTube. Or they could be one of the tens of thousands of people killed or injured by guns in less high-profile incidents each year. In the end, the shooting isn’t a story about ad revenue, but about how easy it is to act on deadly intentions in America. So we should probably let the debate over YouTube’s policies play out without the weight of someone else’s sins.